I haven't been to the blogosphere for some time because life's been hectic. Aside from my search for a new babysitter, I've been consumed at work by another search -- the one for missing mom, Jessie Davis. And tonight, it seems that search has ended. 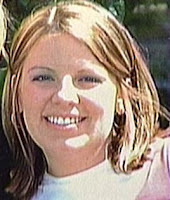 Jessie Davis is a local mom who vanished last week. She was nine months pregnant when she disappeared. This afternoon, authorities found what is believed to be Jessie's body. Jessie has a two-year-old son. And she was expecting to add a little girl to her family. Police have her married boyfriend under arrest. I'm saddened for Jessie - how a mom's life was cut short by someone she loved. I'm saddened for Jessie's son - how a young boy will never know his mother. I'm sadded for Jessie's family, especially her own mom. My heart sank when I was called and told that a body was found. Even after all these days missing, I still hoped that she and her unborn child were safe. My thoughts and prayers go out to Jessie's family and friends. I ask that all of you pray for them too during this difficult time. There are now two more angels in heaven.